Fibrocem - Industrial Plasters Ltd.
Fibrocem is a material primarily designed for production of durable exterior embellishments of high strength and fine definition. 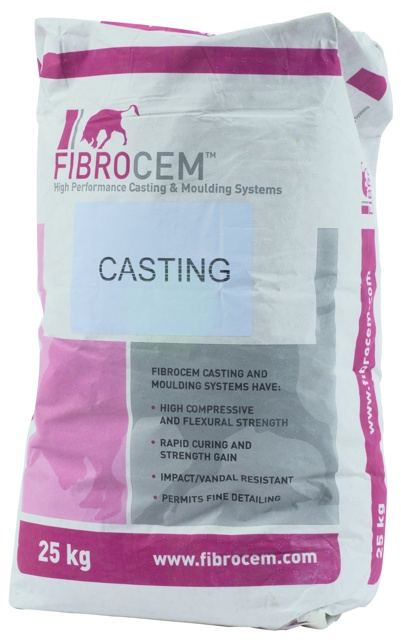 It has a rapid turn round time of around 2.5 – 3 hours, providing a cost and time efficient system of casting. The finish is a pale Portland Stone which is alkali resistant. Extremely easy to use, simply add water and mix, and it can be cast into most types of moulds. A 25kg bag will give you approximately 9mm thick per square metre. This material is known to suffer from compaction lumps in the un-used bags. This can be from being on the lower layers of a pallet, or from being un-used for a while. It's best to knock-up the material in dry form, and/or crushing up lumps by hand, before adding water. For additional information, please click here for Info Sheet.